Todd Hansen, partner in the Minneapolis residential firm Albertsson Hansen Architecture, loves to refresh older homes, to create livable new spaces that look like they were always there. So remodeling a gabled, white stucco house on a city lake for a family of five was a perfect fit for him. Owned by just two previous owners, including onetime Minneapolis Mayor George Leach, the house had hosted Helen Keller and Babe Ruth. It had the pleasing bones of its 1920s origins and a wooded site, but a bowling alley of a living room, a 1970s-era galley kitchen, and just two decent-sized bedrooms. “It was a nice location, but it was pretty tired and cramped for five people,” says the owner. The family had lived nearby for 20 years and wanted to stay in the area. 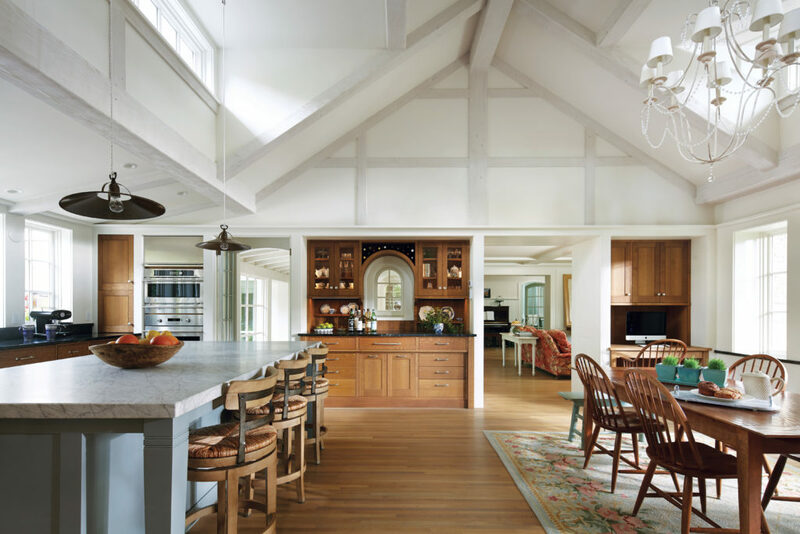 The architectural team, including Hansen, Corri Sandwick, and project manager Mark Tambornino, kept the main part of the house and added two wings: one to the south, which holds the kitchen, dining area, pantry, and lake-facing entryway; and a three-car garage with children’s rooms above on the north. A third addition, treated as a glassed-in former porch, links the other two. The masterful redo, with its crisp white walls and large paned windows, feels both grounded in the past and fresh and new. It takes an astute eye to know what’s worth saving and what’s not. In this case, the central gabled form housing the living room, dining room, basement, and stairs to the second floor stayed, and the appendages to the house— front and back entries and garage—went. The new entry link and garage wing added a second gabled form perpendicular to the main house, creating a welcoming entry courtyard at the back. A large square-paned window inspired by the hotel’s window in the Bing Crosby-Fred Astaire movie “Holiday Inn” signals the entryway. Inside, a stone floor and raftered ceiling give the impression of an old porch that has been enclosed. Two steps lead through an existing archway to the new living room. The size and shape of the living room are the same, but three sides of paned windows and a window seat give it a more porch-like feel. “We wanted to take advantage of the lake view,” says Hansen. A new screened-in porch extends the front façade so it is symmetrical and gracious in scale. A broad doorway leads to the kitchen/ dining addition, the piece-de-resistance of the house. Matte-finished quarter-sawn oak cabinets set into deep walls and a rustic stone replace create a sense of warmth. 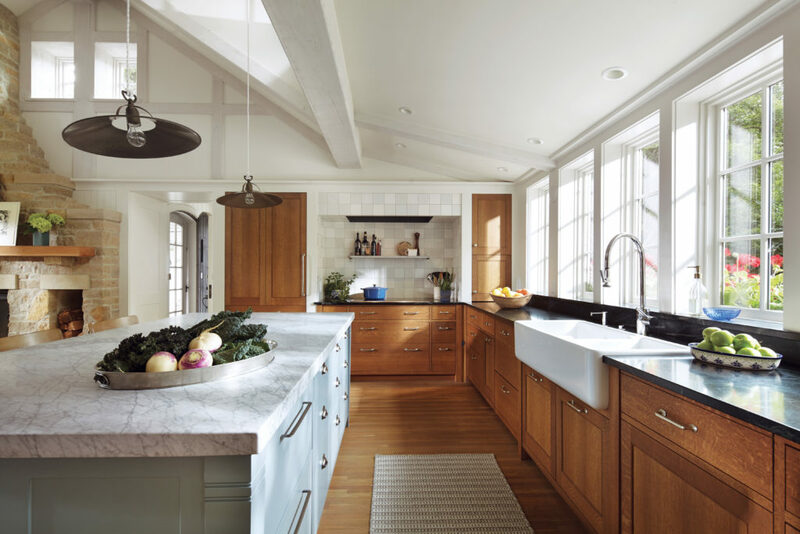 A smoky gray-blue marble-topped island anchors the room. A built-in-buffet incorporates the original, exterior arched windows to internal use—a brilliant adaption of old to new. 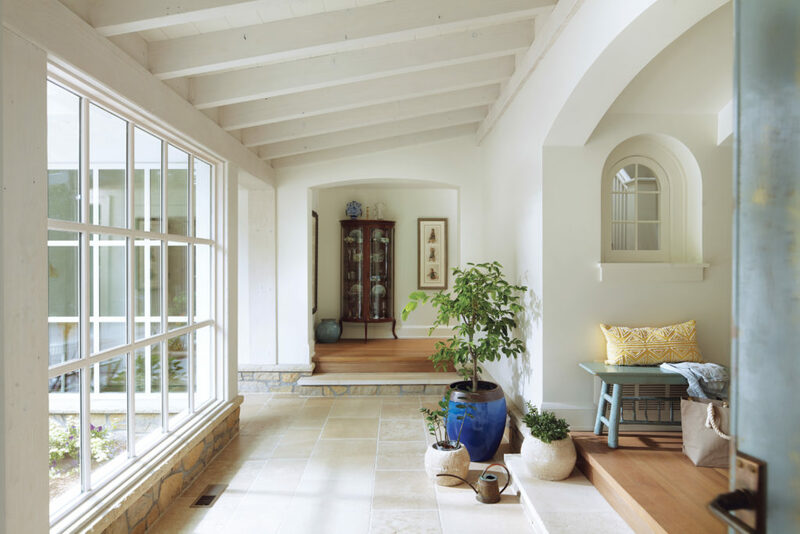 A vaulted ceiling allows in natural light from high windows. Half-timbering breaks up the ceiling planes—but it is low contrast and subtle. A simple pilgrim table and chairs hosts meals, homework, and family conversations. The rest of the house is equally designed for functionality. A mudroom, extra shower, and laundry off a side door make it easy to offload coats, boots, and dog paraphernalia. A pantry o the kitchen reuses old locker-like cabinets with their old chrome hardware. The tall mudroom cabinets are repurposed from the original garage. The former dining room is reconfigured as an office. Its new wall makes a place for an upright piano. The second-floor stairs of the old house now land at another inviting window seat. “We try to organize the circulation so there is natural light,” says Hansen. To the left is a rambling corridor serving the boys’ bathroom with its manly dark-oak décor, a laundry alcove, and a custom-designed ironing cabinet with a pleasant view of the courtyard. The hallway leads on to three simple boys’ bedrooms, each tucked under the gabled roof and each out outfitted with an old laundry-shoot door to a secret space. In the bathroom, three high openings make a mini-basketball game of sorting laundry. To the right of the stairway landing is the charming master suite, which occupies the gabled space of the former attic. The scale is just right: the vaulted-ceiling bedroom with high dormer windows; a lovely marble bath- room; and two right-sized closets—large for her, smaller for him. Hansen says taking cues from the old house kept the scale of the new spaces from being overblown. The old basement houses new life—a guest room with enviable lake-view windows and a man cave complete with a pool table and bar made from salvaged materials found in the old garage. A peek through a basement window confirms that the new stone and brickwork perfectly match the old. Indeed, inside and out, all is seamless. Linda Mack, longtime architecture critic for the Star Tribune, writes for national and regional magazines on architecture and design. She is the author of Madeline Island Summer Houses: An Intimate Journey, an armchair tour of 27 summer retreats on the historic Lake Superior island.